A hard rubbish collection, now termed Annual Hard Waste Collection, is a service provided my many local councils around about once a year to collect any items that are not suitable for the weekly collection. 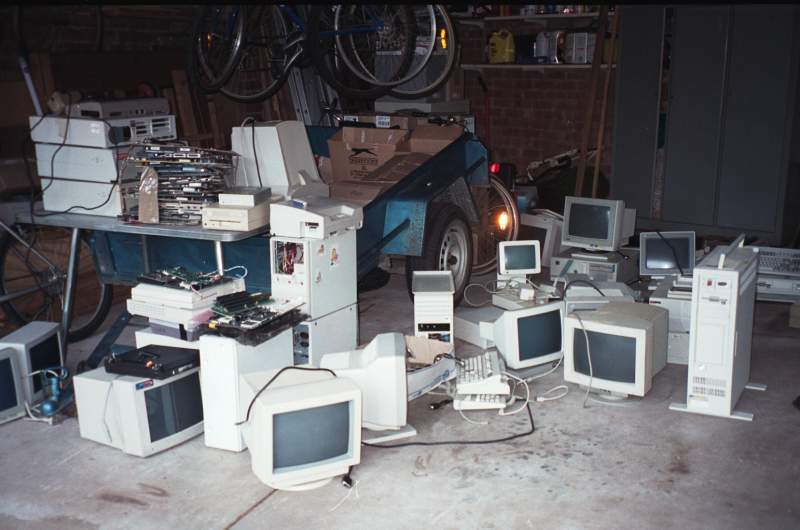 Items typically include old appliances (eg Washing Machines and Refridgerators), furniture, large amounts of green waste (same time but different truck for recycling), and of course old computers. On the morning of a Monday sometime during September 2000 I made a comment to a friend at Uni that on my way to Uni I had spotted a couple of interesting things put out for the collection. 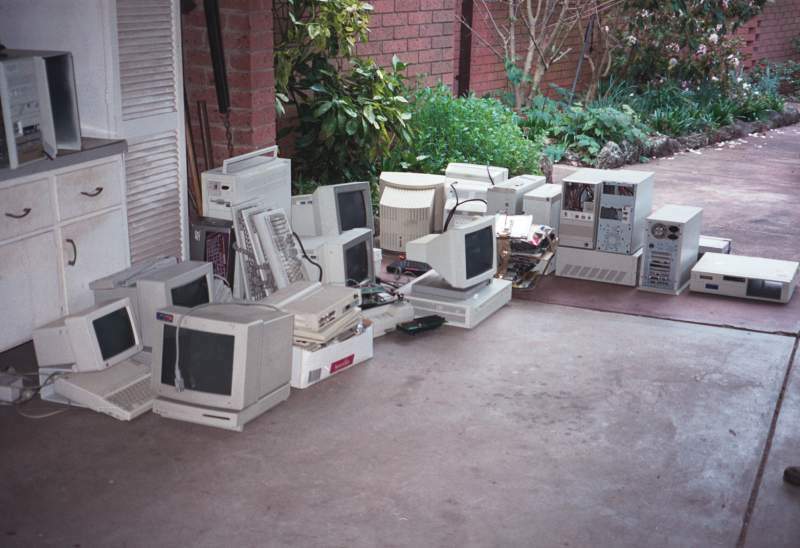 One thing led to another and we ended up driving around my area collecting all the promising computer parts we could find and dumping them in my garage. Almost all of the initial haul. To think that all the parts on the floor and on the table were being discarded by people. Shame on them. Moved over to where the first photo was taken from this is what was left after the first cull that got rid of the really worthless stuff. After the inital cull it was all dumped inside with a few more items discarded and some taken by my friend. It was his car that we drove around in all afternoon so he took what he wanted. Luckily he wasn't interested in and of the older stuff and none of the Apple components. Over the next couple of days (I had to be quick so I could put anything I didn't want back out onto my nature strip) I culled it down even further. 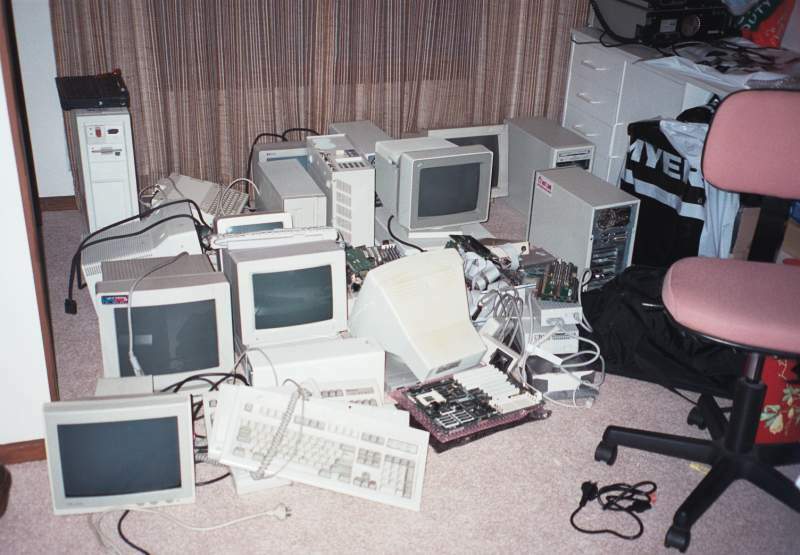 Most of the items culled were monitors that didn't work, keyboards and useless components. Unfortunately the IBM PS/2 80 had to go because it had got wet inside and was half rusted, I did grab the two (?) ethernet cards from it for the 50z though. The Apple pile. 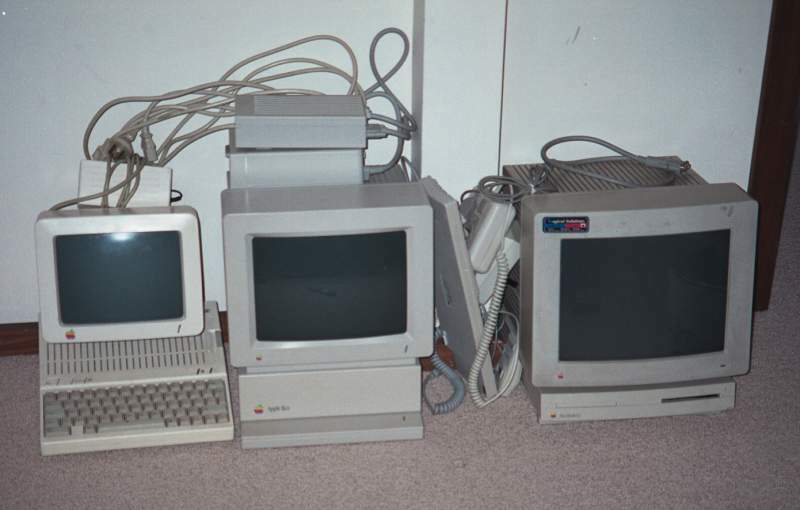 An Apple IIc, Apple IIgs with 3.5" and 5.25" floppies, keyboard and mouse for the IIgs, couple of joysticks (gone now), and a Macintosh LC with Apple High Resolution RGB Monitor (my first Macintosh). PC and Other pile. 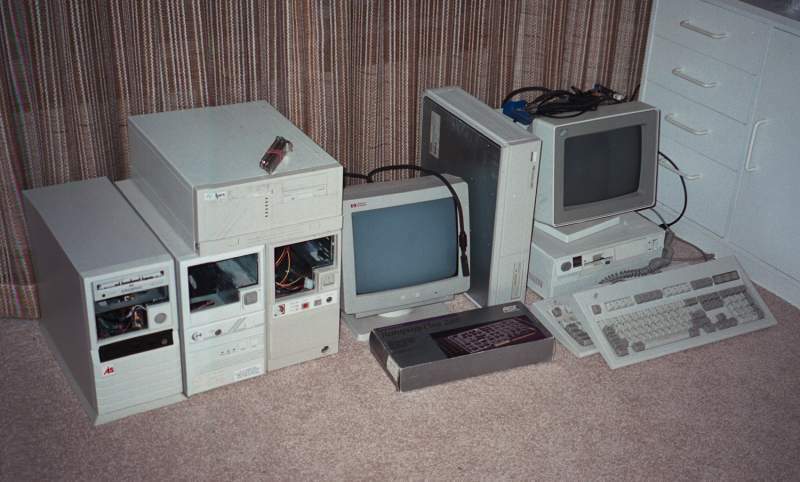 Three mini tower cases (cases are gone, I still have some of the internals), Ipex desktop case, HP 14" Monochrome Monitor, Rampage Plus, DecStation 2100, IBM PS/2 50z with IBM monitor and two IBM keyboards. The Parts pile. These are parts that I deemed (rightly?) worthwhile to save. 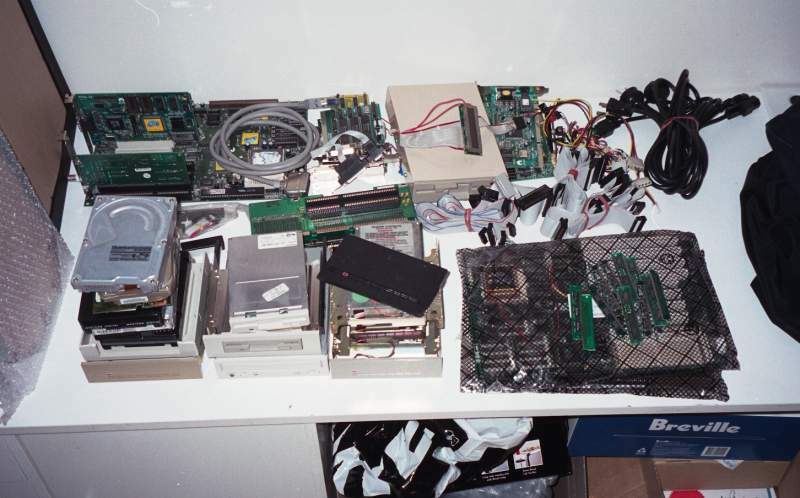 Old hard drives (IDE and MFM), floppy drives, memory, pentium motherboard, and various cables.